You could have bought Wal-Mart stock in 1980, a decade after it came public, and after Sam Walton had become famous as the billionaire who drove a pickup truck. If you held the stock from 1980 through 1990, you would have made a 30-fold gain, and in 1991 you would have made another 60 percent of your money in Wal-Mart, giving you a 50-bagger in 11 years. Today, Sam Walton’s (the eponymous founder CEO of Wal-Mart) descendants as a group are the wealthiest family in the country. Key to the Walton Family’s wealth has been their steady holding of Wal-Mart common stock. Sam Walton himself, and then his kids, had mostly kept their shares since 1970s. Today, the family still has a controlling stake of 51% in the Wal-Mart enterprise. High-quality businesses have enduring business-models. They can navigate through a recession and come out even stronger on the other side. Unlike a turnaround opportunity or mediocre-but-cheap business, one could stay invested in a high-quality business throughout the ups and downs of economy. Research shows this too. In 2013, Credit Suisse published a research paper titled “Was Warren Buffett Right: Do Wonderful Companies Remain Wonderful?” The paper grouped all public companies in four quartiles based on its assessment of quality of each business. They then studied performance of each one of them from 1985 to 2012 and measured how they did over the years. 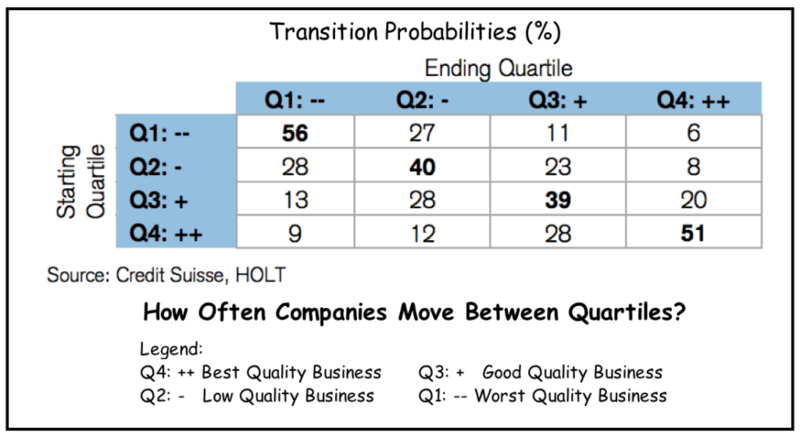 Since 1985, companies that were ranked in top two quartiles had the highest probability of staying in the top two ranks five years onwards. Conversely the companies who were in the bottom quartile tended to stay in the same quartile (or move up to the second-worst quartile) — but very few ever got into top ranks. Corporate profitability is sticky. Good companies tend to remain good companies, and poor companies tend to remain stuck in the mud. Sustainable corporate turnarounds are difficult to execute, and investors should be careful about overestimating the odds of success. So the answer to the question posed in the title of that paper was indeed a clear yes. High-quality companies can be hard to find but they often stay good over long periods of time. And that is a major reason to invest in them. A business that stays profitable for long periods of time has that much more runway to grow and compound our wealth. In an earlier blog post (Don’t be dismissive of low returns), I posed this question: Who could ever get rich making paltry 15% annual return? We can, if we could consistently get that return over a long time-period. In the same post, I also shared how 20% return could outpace 200% return as long as we have opportunity to consistently reinvest. Take the case of Walton’s family. They became uber-rich in less than 50 years by staying patient and staying invested in their business. What is a high-quality business? It’s difficult to come up with a precise answer. It depends on multiple different aspects of a business – some quantitative, others qualitative. One key quantitative measure that I pay close attention to is return on invested capital (ROIC). Has it been consistently high and well above its cost of capital? 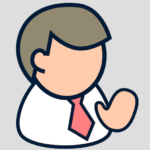 It’s also good to get a handle on a business’s intrinsic value. I wrote about intrinsic values in this post. However, I don’t just study numbers. I look at other intangible factors too. I check if the business has an economic moat to fend off competitors. Does it have shareholder friendly management with significant skin in the game? What is their capital allocation policy and how well do they implement it? You can read more about my thoughts on these questions in these previous posts: Are moats really lame?, Let smart people work for you, My investments with founder CEOs, Grading CEOs as capital allocators. What are high-quality businesses in my portfolio today? Take a look at my recent purchases in December here. Those were my opportunistic buys when the market had dropped more than 15%. I consider them all high-quality businesses that I plan to hold on to for years. Of course, this is not to say that shares of strong businesses never go down. They do. I have two anecdotes to tell from my own investing past. I bought Amazon stock in 2000 at about $70 a share – only to see it drop like a rock to a low of $10 over the following two years. I also owned Berkshire Hathaway in 2009 when it dropped 51% from its 2008 peak in less than a year. See these two blog entries: My lucky break with Roth IRA and A lesson from Buffett. Needless to say, both are excellent businesses and went on to reach even greater heights as the U.S. economy eventually recovered. One risk to consider when investing in quality well-known businesses is that we might overpay to own their shares. Generally, established good businesses are recognized early by the market and trade at premium to others. If I overpay for a good business, I might not get good return on my investment. Consider the case of Microsoft (MSFT) for instance. It was trading at P/E ratio of about 60 during the 1999-2000 Internet market bubble. 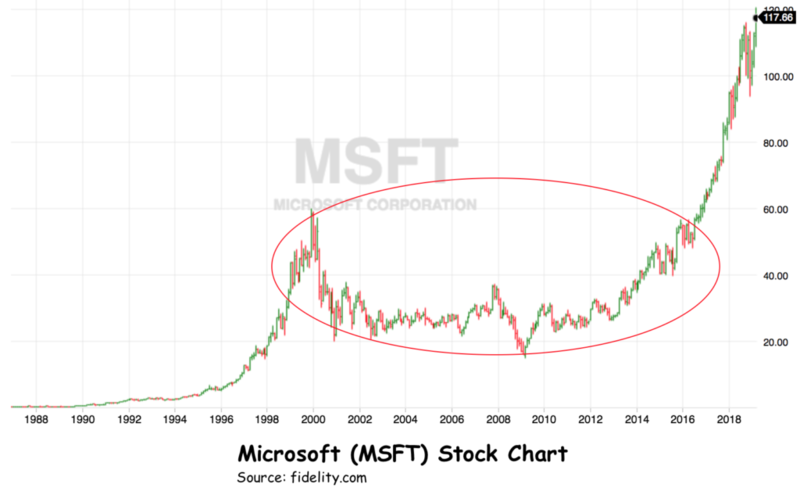 Investors who bought Microsoft at those lofty prices did not make any money on their positions until more than a decade later (including dividends that the company started paying in 2003). Even though during that time period, Microsoft as a business was doing quite well – both its earnings and dividends were growing fairly consistently. The best way to handle a situation in which you love the company but not the current price is to make a small commitment and then increase it in the next selloff. I will wait for a selloff in Intuitive Surgical to scoop up more shares.